With Christmas just around the corner, one Texas family is celebrating with an extra special gift — an adopted baby brother. Upon seeing their daughters’ wish, parents Courtney and Steve Solstad gathered Chloe and her sisters, Emma and Maci, around the Christmas tree to surprise them. The surprise was a little someone under the holiday tree — an adopted baby brother named Nathan. The family recorded the adorable moment on camera as the daughters saw their baby brother for the first time. Upon seeing Nathan, the three siblings were immediately filled with joy. They laughed and jumped up and down while squealing in happiness. The mother, Courtney, said that her daughters did not know anything about their baby brother until they discovered him sleeping under the Christmas tree. “We met them at the door and told them that we had been out Christmas shopping and got them a gift to share… and it was under the tree,” Courtney said. Upon sharing their Christmas adoption video, over 1,700,000 individuals have viewed it online. The video has since gone viral as it touches the hearts of many around the world. 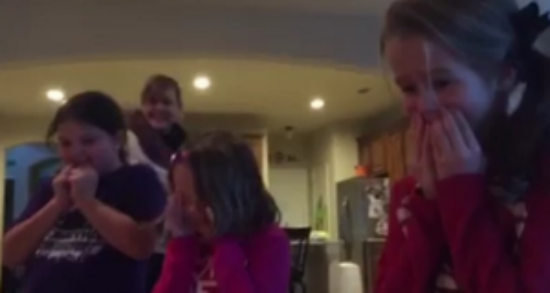 The siblings’ reaction in the video was truly heartwarming. Watching how excited they were to see their new baby brother really puts a smile on my face.